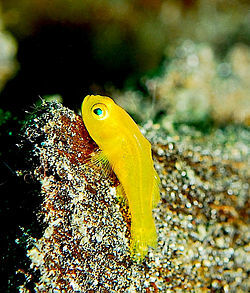 The Yellow Clown Goby, Gobiodon okinawae, also known as the Okinawa goby or yellow coral goby, is a member of the goby family native to the western Pacific from southern Japan to the southern reaches of the Great Barrier Reef. As the name implies, they are bright yellow in color, save for a whitish patch on each cheek. These fish are not generally aggressive, though they can actively protect their territory against their own kind. Their primary defense against predators is a poisonous, bitter mucus on their skin that makes them unpalatable.